Arsenal showed signs of recovery from their recent dismal run of form as they twice fought back from behind to draw with Manchester City at Emirates Stadium. The Gunners had lost four out of their previous five Premier League games, and faced City against uncertainty surrounding manager Arsene Wenger's future, with more protests staged before kick-off. Arsenal got off to the worst possible start when Leroy Sane put City ahead after only five minutes, running on to Kevin de Bruyne's routine pass to round David Ospina and score. Theo Walcott capped a spell of Arsenal pressure to scramble home an equaliser five minutes before the break - but they were on terms for only two minutes before Sergio Aguero's powerful finish put City back in front. Arsenal lost Laurent Koscielny to injury at half-time and it was his central defensive partner Shkodran Mustafi who rose above City's defence from a corner to restore parity after 53 minutes. Aguero missed two good chances for City and manager Pep Guardiola was furious that a late handball appeal against Nacho Monreal was ignored, leaving his side in fourth and Arsenal in sixth place in the table - seven points of the top-four pace. What does this mean for Wenger? Two banners were held aloft at the final whistle - and both summed up the confusion currently surrounding Arsenal and manager Wenger. One read "Forever In Your Debt - One Arsene Wenger" and the other carried the slogan "All Good Things Must Come To An End." There were renewed protests from a noisy, but relatively small, group of Arsenal fans before kick-off to illustrate the pressure on Arsenal's manager but there were precious few signs of discontent inside the stadium. The smart money remains on Wenger extending a stay as manager that stretches back to October 1996 - but this result and performance did little either way to clear the muddied waters around this part of north London. Wenger insists his decision is made while Arsenal's board say the next move will be mutual - so a draw almost summed up what seems to be the current inertia among the decision-makers. If Arsenal had won, it would certainly have made any announcement more palatable, while a loss would have made it a harder sell. As it is, a draw means the uncertainty goes on. Arsenal needed to show signs of fight and resilience after a desperate sequence of four defeats in their previous five Premier League games - and they certainly showed that, if not huge quality. Arsenal have won exactly the same number of points (51) after 28 games as they did last season, with exactly the same record (W15 D6 L7). The Gunners twice fought back from behind in a performance that was centred on determination rather than the dazzling football of old, but Wenger can at least take some comfort from that small mercy. Arsenal's wafer-thin confidence was exposed by the manner in which they defended for both City goals, opened up too easily by De Bruyne's routine pass for Sane's opener and losing concentration and shape far too easily to concede a second to Aguero two minutes after Walcott's equaliser. They still display very obvious defensive faults and the Achilles injury to Koscielny, the most reliable member of their rearguard, could prove to be a significant setback in the run-in. This is a frail Arsenal side, reduced in self-belief by that recent poor run, but avoiding defeat here may just build some momentum as they chase a place in the Premier League's top four. City may have been offered just the slightest hope of a route back into the title race by Chelsea's surprise loss at home to Crystal Palace - and a win here against Arsenal would have further cemented their place in the top four. So a draw represents a real missed opportunity for Guardiola and his players, who failed to take advantage of the perfect start given to them by Sane's goal. City cut Arsenal apart in the opening phases, when De Bruyne hit the post and Ospina saved well from David Silva. Guardiola's side play some scintillating attacking football but must discover a ruthless streak, with even the world-class Aguero missing inviting headed chances either side of Mustafi's equaliser. City, without question, are fashioning an exciting attacking side with Sane, Aguero, Raheem Sterling, De Bruyne and Gabriel Jesus to come back, but this was another example of them being a work in progress. 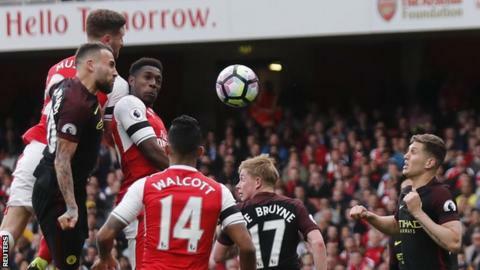 Arsenal boss Arsene Wenger: "We were nervous and surprised by their start. I feared that we could start with the handbrake on because of the pressure we are under. "We are in a tough battle for the top four. I am professional and I have shown great loyalty in the past. "I love this club, I don't know how long I will be here, I am clear in my head, that's the most important thing. The decision will be soon." Manchester City manager Pep Guardiola: "We didn't play in the first half, after the goal we forgot to play, the desire went. In the second half we played more. "We suffered a lot in the first half because we did not make those passes together. "On Wednesday we play against a team [Chelsea] who is stable in what they do. We don't have too much time to prepare but we go back to Manchester now and recover and then come back to London." Arsenal have lost just one of 20 home Premier League matches against Manchester City (W12 D7). Kevin de Bruyne has assisted 11 Premier League goals this season, the joint-most in the division along with Gylfi Sigurdsson; only once before has a City player assisted more goals in a single Premier League season (David Silva with 15 in 2011/12). David Silva registered his 100th Premier League goal involvement with an assist for Aguero's goal - the Spaniard has scored 37 goals and assisted 63 since his debut in August 2010. His tally of 63 assists is 12 more than any other player since his debut. Sane's goal after four minutes and 22 seconds was the earliest Premier League goal Arsenal had conceded at the Emirates since February 2012, when Louis Saha scored after three minutes and 51 seconds for Spurs. Ten of Sergio Aguero's 14 Premier League goals this season have come away from home (71%). Mesut Ozil has assisted four Premier League goals against Man City, the joint-most he has managed against an opponent (level with Aston Villa). Mesut Ozil's assist in this game was his 50th for Arsenal in all competitions. There is a full round of Premier League fixtures in midweek. Arsenal face West Ham at home on Wednesday evening, while Manchester City face Chelsea at Stamford Bridge. Match ends, Arsenal 2, Manchester City 2. Second Half ends, Arsenal 2, Manchester City 2. Attempt missed. Jesús Navas (Manchester City) left footed shot from the right side of the box misses to the left. Assisted by Pablo Zabaleta. Corner, Manchester City. Conceded by Alex Iwobi. Attempt blocked. Sergio Agüero (Manchester City) left footed shot from the centre of the box is blocked. Assisted by Jesús Navas with a cross. Attempt missed. Alex Iwobi (Arsenal) right footed shot from the right side of the box is too high. Assisted by Héctor Bellerín. Offside, Manchester City. Gaël Clichy tries a through ball, but Leroy Sané is caught offside. Attempt blocked. Kevin De Bruyne (Manchester City) left footed shot from outside the box is blocked. Assisted by Sergio Agüero. Attempt missed. David Silva (Manchester City) left footed shot from outside the box is close, but misses to the right. Assisted by Yaya Touré following a corner. Corner, Manchester City. Conceded by Gabriel. Offside, Arsenal. Shkodran Mustafi tries a through ball, but Olivier Giroud is caught offside. Substitution, Arsenal. Alex Iwobi replaces Danny Welbeck. Offside, Arsenal. Alexis Sánchez tries a through ball, but Nacho Monreal is caught offside. Offside, Manchester City. David Silva tries a through ball, but Sergio Agüero is caught offside. Attempt missed. Leroy Sané (Manchester City) left footed shot from the left side of the box misses to the right. Assisted by Sergio Agüero. Attempt saved. Sergio Agüero (Manchester City) header from the centre of the box is saved in the bottom left corner. Assisted by Jesús Navas with a cross. Attempt saved. Fernandinho (Manchester City) right footed shot from outside the box is saved in the centre of the goal.